Washington, DC – The Outdoors Alliance for Kids (OAK) is honored to receive support from one of its founding steering committee members, REI. With a generous grant of $30,000, REI is ensuring OAK can continue to be an effective national advocate for equitable and readily available opportunities for children, youth and families to get outdoors. REI (Recreational Equipment, Inc.) is a national outdoor gear and clothing retailer and a member of OAK’s Steering Committee. REI is committed to stewardship and giving back to its members, employees and communities. Find out more about REI’s stewardship efforts. I am pleased to announce that one of the founders of the Outdoors Alliance for Kids (OAK), REI, recently announced support for the Alliance with a gift of $30,000. The grant will help OAK meet our mission to connect children, youth and families with the outdoors. Just over four years ago, before OAK was OAK, when we were just eight passionate people scheming in a room together about how we were going to help support and grow a national voice to advocate for getting youth outdoors, REI was there. REI has been with OAK from the beginning and I am thrilled to see how much this partnership has grown and deepened in just a few years. I want to extend my deep gratitude to REI for investing in OAK’s mission that is now shared by 75 organizations. REI is dedicated to “inspiring, educating and outfitting its members and the community for a lifetime of outdoor adventure and stewardship.” OAK will help REI meet its mission by addressing the growing divide between children, youth, families and the outdoors with decision-makers at the federal, state and local levels. Through this grant, OAK will educate leaders at all levels and advocate for administrative policies directed at getting children, youth and families outdoors with a focus on education, community health and wellness, and environmental stewardship. We’ll deepen partnerships with federal agencies to coordinate, leverage and expand opportunities to get young people outside. We’ll take our work to the state and local level with the recently developed ECHO (Every Child Healthy Outdoors) Across America Toolkit. (Learn more about the ECHO Across America Toolkit by watching our online Webinar). And we’ll grow and broaden our membership. Sierra Club is one of several organizations including the American Heart Association, Children & Nature Network, Izaak Walton League of America, National Recreation and Park Association, National Wildlife Federation, The North Face, Public Lands Service Coalition (a program of The Corps Network), REI, The Wilderness Society and the YMCA of the USA that make up OAK’s leadership. The members of OAK are brought together by the belief that the wellness of current and future generations, the health of our planet and communities and the economy of the future depend on humans having a personal, direct and life-long relationship with nature and the outdoors. On behalf of all the members of the Outdoors Alliance for Kids, here’s a big THANK YOU to REI for your investment in this important work! 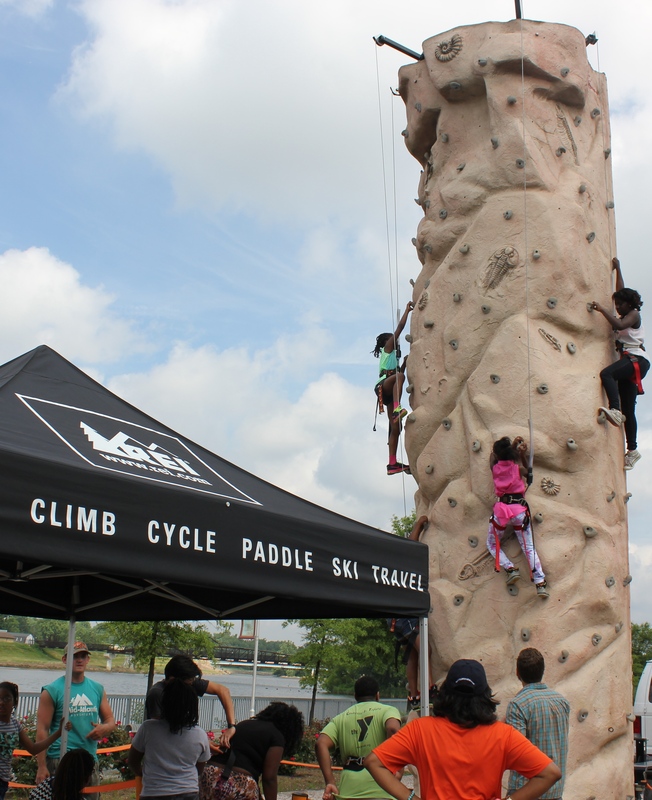 REI partners with OAK during Great Outdoors America Week 2014 to teach local kids how to rock climb.